Spring always inspires me to take photographs. The spring of 2012 started very early with 80+ degree Fahrenheit temperatures in March. I measured 88 degrees on my deck! This is clearly not normal for that time of year. Luckily - for photography, at least, spring slowed down and is giving us all time to enjoy the beautiful pastel colors of the flowers, trees and other vegetation. It is now May 1st, and I am finding the spring to be more more advanced than it is “supposed to be” for this time of year. The four thirds system was somewhat interesting, although I initially did not like the fact that the sensors were even smaller than my APS-C Nikon sensors, yet the image quality kept improving. Still, the four thirds bodies did not get interestingly small for their small sensors until the Olympus E-P1. I came pretty close to buying and Olympus E-P1 when they first came out, but did not like the fact that this camera did not have a built-in viewfinder. It also did not have a built-in pop-up flash, but that I could live without. Somehow, the E-P1 seemed a bit overpriced at the time. The kit price was $700, if I remember with the collapsible 14-42 (28-84 full frame equivalent) lens. I was a bit surprised that even the E-P1 was a little bigger and a little heavier than I expected, and was not ready to make that compromise. Then came the E-P2 which had a viewfinder option, but was even more expensive, then the E-PL1 with simplified controls (although cheaper), and then the E-PL2 (also with simplified controls) and then the latest series, the E-P3, E-PL3, and E-PM1. The latest range of cameras was really quite interesting, and seemed desirable, except of the prices once again. Also, the image quality had not really improved in about two years. Olympus was still stagnating in this area due to the use of the same basic sensor as the original E-P1. Now Panasonic’s products had also not stood still, and Sony had come out with their NEX line of APS-C cameras. I had looked at the Panasonic GF-1 when it first came out (a good and desirable option), but dismissed the DSLR like G series (G1, G2, GH1, GH2, G10, G3). I had not even considered these cameras, in part because I had never seen one, and they look BIG in the pictures. Why downsize the sensor if the camera stays nearly as big? To make a long story short, I finally looked in great detail at the new OM-D EM-5, which looks like a superb (although still highly overpriced) camera. I still do not like the electronic viewfinder (although at least it has a viewfinder), and I still do not like the price, but at least the sensor had been upgraded to the latest technology. The interest in the EM-5 made me look at all of the other cameras that had a similar Panasonic sensor (the 16 MP one). This led to looking at the Panasonic GX1, G3, and GH2 (that actually has a slightly larger multi aspect ratio sensor with 18 MP). After close comparisons, I gave up a bit in size and purchased a used Panasonic GH2. This was cheaper than the combination of Panasonic GX1 and viewfinder and more capable than the G3, although a bit heavier and larger. The GH2 also has the most flexible sensor. All of the Panasonic 16 MP sensors appeared in DPREVIEW.COM comparison tests to have ultimate picture quality that should rival my 12 MP Nikon D300. I have not done any formal testing at this point to really compare my new system to my old. I have to say, though that two of the three lenses that I purchased with my new system combined with my GH2 are showing much promise. You can judge for yourself in the spring images below, but I can say that my Nikons and Nikon lenses would not do better in this situation. In addition, taking these pictures was easier with the folding LCD panel and the touch focus capability. I hope to say more in a review at some point later on. I also need to say that after reading the OM-D EM-5 review at DPREVIEW, I have no regrets. I expect that in the final analysis my GH2 will be just as capable (at least in RAW, I do not shoot JPG) as the EM-5. The only drawback is the lack of in body stabilization. All at a price that is $500 less than I would have paid for a difficult to get new Olympus. Camera bodies are really just commodities these days, aren’t they. Here are the images from earlier today. Both images are from my back yard, near the beaver pond. 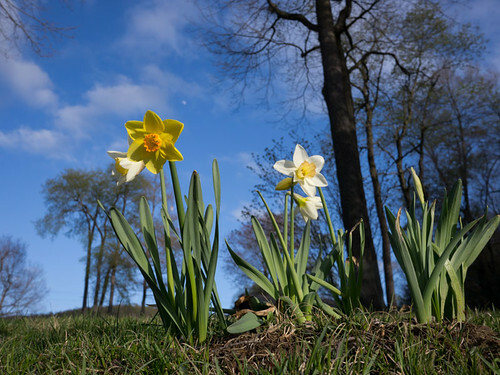 Daffodils were planted last fall to enhance the capabilities of my “picture farm.” Both images taken with the Panasonic 14 mm “pancake” lens. This semester I have split my photography classes into an advanced (Photo 2) and a basic section (Photo 1). The classes are evening and morning to allow capture of morning and evening light. One evening my Photo 2 class was out observing sunset over The Family Foundation School property, and we encountered the beautiful skies that you can see in the image below. This is the kind of light photographers love! My students in this class are learning to make high quality pigment inkjet prints and are enjoying new Epson Stylus Pro 4900 and Epson Stylus Pro R3000 printers. We have a number of nice prints from this evening! This blog has been in existence for more than two years now, yet I have not updated or posted until today. 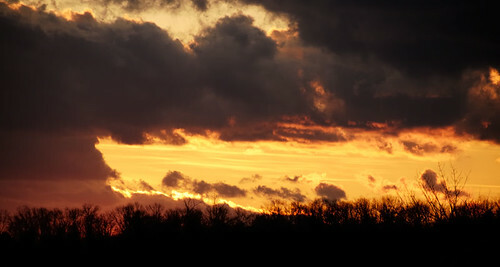 I resolve to add more new content over the next year, and hopefully share some images that will intrigue and inspire. Part of the reason that I have not posted is that I have not done much photography in the last year, just snaps and vacation images for the most part. Still, there are a few images that I will endeavor to share. The winter has been interesting, but disappointing. We only had snow cover for a very short time in the northeast. Yet, I did have an opportunity to go outside during the last snow of the season and take some photographs while out with my photography students. These images are taken around the chapel at The Family Foundation School. My students also enjoyed this day! The snow was wet, it had frozen overnight, and it actually looked like winter! My students and I were not outside long - it was snaining (snowing / raining! ), and as they often are, they were not dressed appropriately. Still, I also like the icy branch image below that I captured during the same shoot. It has now been three weeks since my wife and I returned from our trip to Shenandoah. I had originally planned this trip to allow for us to experience spring conditions for hiking and photography. Since we live “up north”, in the Delaware Valley area of New York State, we were looking forward our trip and the more advanced spring conditions “down south”. As it turned out, the weather turned drastically colder the night we arrived, with significant storms (see sample photo in preceding post). Nights actually went into the thirties, with the first two days not even hitting fifty degrees. Not exactly what we had planned for! Since we did have the proper equipment and clothing, this was not too bothersome, but it did somewhat limit what we did in the first day or two. Essentially, we ended up doing some hiking in more wooded, lower lying areas during the sunny parts of the day. Camping at Big Meadows placed us right in the middle of Skyline Drive, the center of the Park. The campground at Big Meadows is also right along the Appalachian Trail, and we had intended to hike portions of the AT during our stay. Campsites at Big Meadows vary in terms of available amenities - some allow electrical hook-ups for RVs, our site was a “walk-in site”, a bit farther removed from the rest of the campers - essentially at the edge of the campground. We had intended to “bushwhack” to the AT from our site, and as it turns out this was entirely possible due to the open nature of the forest in this area. These are nice campsites, and we would be more than happy to do this type of camping again. Even the walk-in sites are not that far away from parking or bathrooms, and the AT is only minutes away. We did two hikes directly from our campsite. In the southerly direction there is a waterfall that has a nice stone observation platform that turned out to be just under five miles round trip (this is more or less a loop hike, with only the first and last mile or so on the AT), and to the north it is possible to hike to the Hawksbill - the highest point in the park, and eight mile round trip (this one is an out and back.) 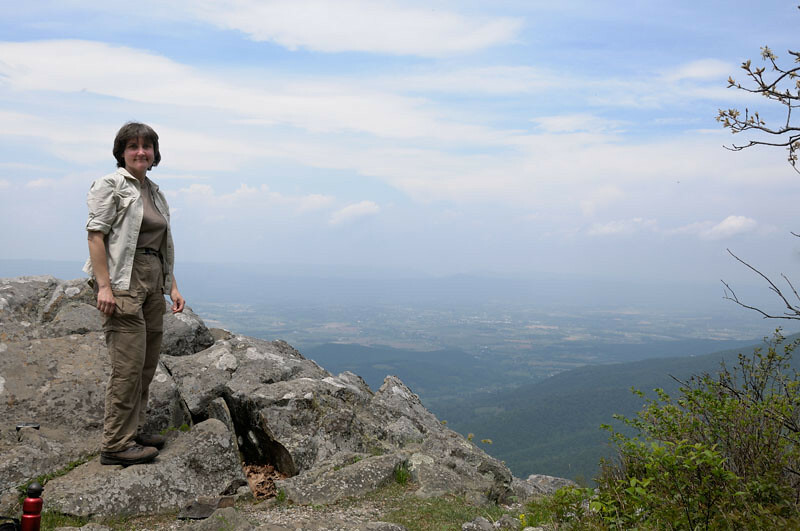 Both of these hikes were very, very nice, but the photographic focus of this post is the Hawksbill hike. Most of the hiking on the AT is quite easy, as the trail runs along the ridges in the park, is rather wide and very well maintained. The trail is also rather smooth for hikers like myself who have grown up hiking the trails of New York’s Adirondack Mountains. 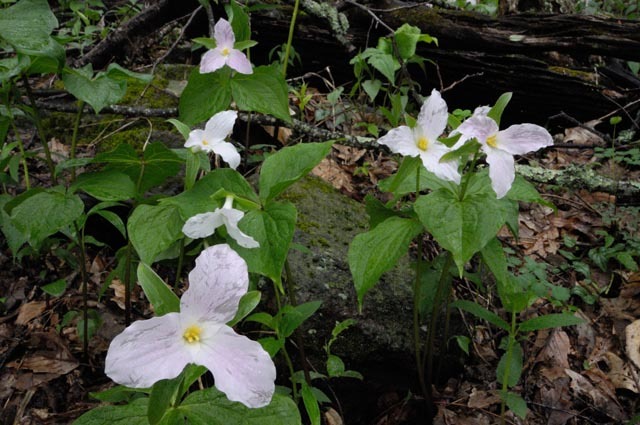 As we hiked along the AT toward the Hawksbill, we reveled in the beautiful spring flowers, such as Azaleas and Trilliums, and many other varieties that we are not familiar with. It was a bit hazy on this day, yet, the views from some sections along the trail into the Shenandoah Valley to the West were exhilarating. The first set of views came up at Fischer’s Gap where the trail opens up into a steep meadow for about 50 yards. This is also where we saw our first Trilliums along the trail. From here on, the trail continued down to an elevation of below 3000 ft. At this point we knew that we would have some work to do - as the Hawksbill is at 4051 ft, however, the nice trail and moderate grades made hiking easy. Also along the way, we saw Mountain Laurel whose buds were only just starting to bloom. 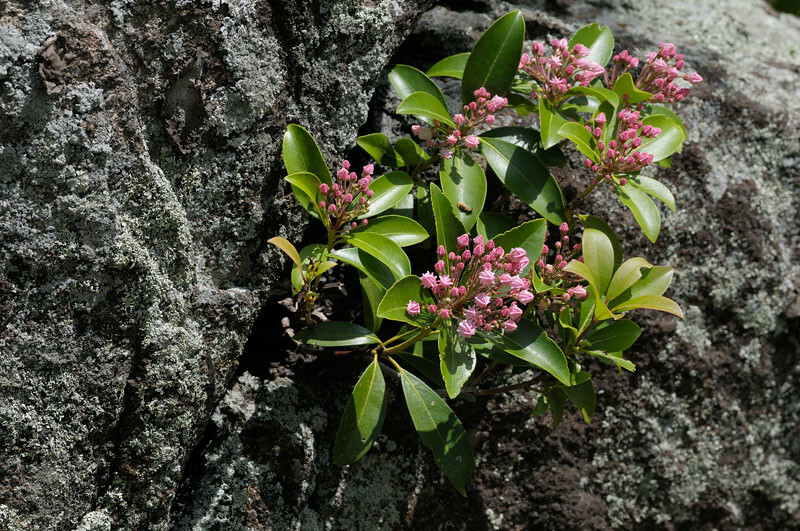 We marveled at the geometry of the opening buds, and the image below shows how these shrubs grow even under adverse conditions - against all odds right out of the rock wall along the trail. As we continued along the trail and toward the Hawskbill summit, we heard birds singing in the trees, but did not initially get a good glimpse. We often stopped at the view spots and let our dogs enjoy the view (seems that even they like looking out over the valley!) At one spot, we got a glimpse of something very bright red chirping in the trees. I don’t usually carry my long zoom lenses on a hike such as this one, but had actually done so anyway this day. I pulled out my 80-400 VR Nikkor (click to see my review), mounted it on my camera, and went to see what kind of luck I would have photographing this bird. As I followed the animal from tree to tree, I noticed that it’s movements were not really dictated by my presence. Interesting - as I have found that my 400 mm limit is usually a show stopper for song bird photography. I continued following this bird and photographing, essentially until I thought I needed to move on. I might have had an opportunity to get even better images, had I been more patient. 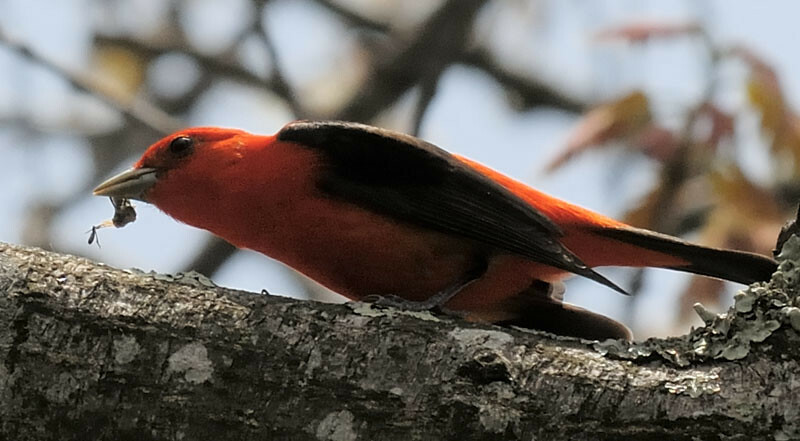 Still, my processed images was good enough to identify the bright red and black bird as a Scarlet Tanager. All that said, this was a great hike, wonderful nature, good company (my wonderful Wife, and our two German Shepherd Dogs), and some really great views. So, I think it would be appropriate to show at least one image of the views possible along the trail. The image below is just a bit below the summit of Hawksbill. We chose to stop here for lunch after we made it to the summit, and on our way back. It’s more fun to eat without other people around. Still, this image shows the beauty of the Shenandoah Valley, even though the humidity was high and the visibility was not that good this day. Bottom line, this was a really, really great trip. This is definitely a park we will revisit, especially since it is one of only two National Parks that allows dogs on the trails. 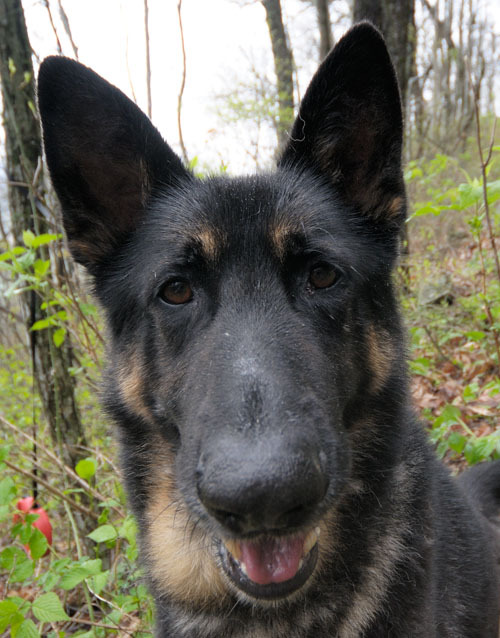 I can highly recommend Shenandoah to any dog owner that likes hiking and camping. One word of caution, however: be prepared with insect repellent. The trails are loaded with ticks. If you bring dogs, I highly recommend that they be treated with Frontline Plus prior to coming. Also makes sure to check yourself at night, shower before going to bed, and check your gear prior to storing it on your return. During our camping week at Shenandoah National Park we encountered enough rain and storms to enjoy some drizzle inside our tent. The winds were blowing at up to 35 mph with heavy rains two entire days of our stay. In addition to the two whole days of rain, we also had light rain about half of the nights of our stay. Still, the rainy and stormy weather provided for some interesting lighting. This included rainbows and foggy conditions, as well as some interesting sunsets. In the image below, you can see a thunderstorm rolling in toward Skyline Drive, from the west. This was probably the first time I’d ever seen the setting sun and lightning in the same area of the sky. This image was taken with the Nikon D200 and the 18-70 lens. Image was taken from my vehicle, out the window. In my previous post I referred to white tailed deer as the squirrels of Shenandoah. Indeed, white tails were the most common animal we saw last week, bar none. They were pretty much everywhere - even throughout the campground. It was mind boggling to see a herd of deer pass within 50 feet of the nearest tent with nary a care. Even more astonishing was their behavior when our dogs barked at them from 50 feet away. They just stopped and LOOKED at the dogs barking their heads off at them. I had never seen anything like it. That said, there was another, different kind of “squirrel” at Shenandoah. 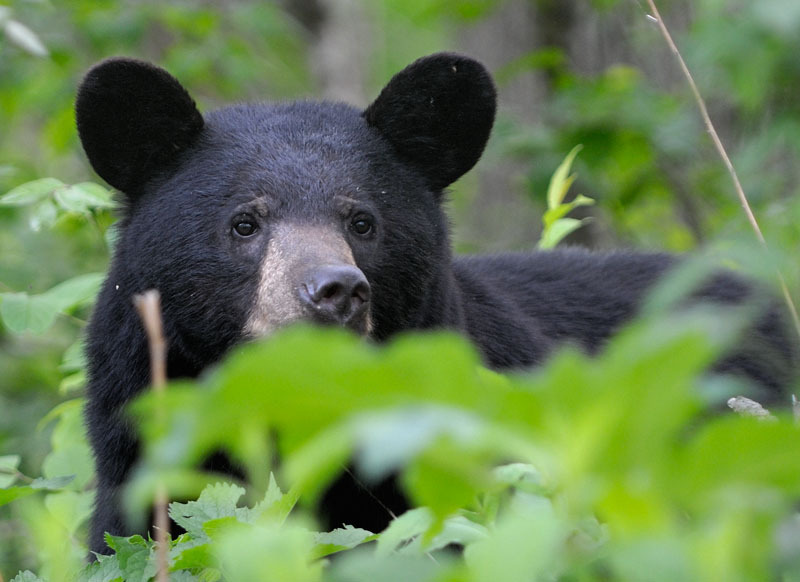 My wife and I saw more black bears at Shenandoah than we did at Yellowstone some years ago. 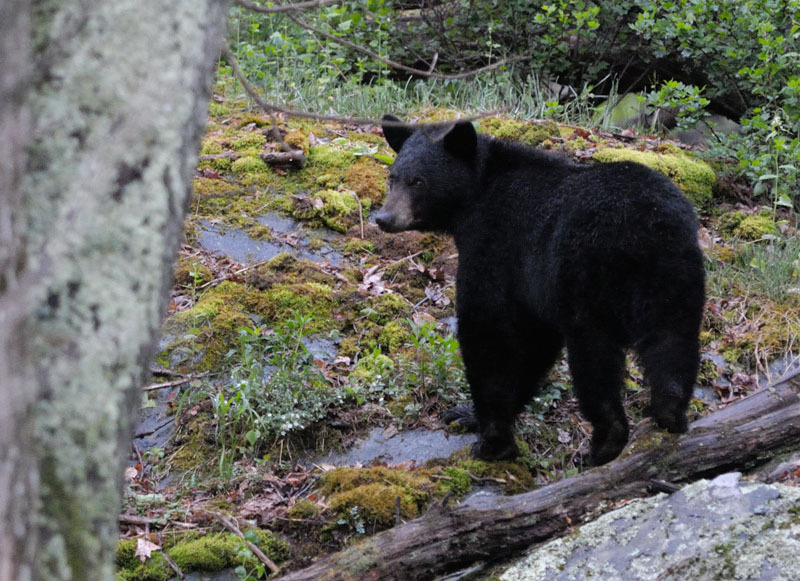 In evening light it was possible to sight bears almost at will by driving along Skyline drive. As a matter of fact, one other park visitor told me that they had sighted bears five times in the span of one hour. The most bear sightings we made in an hour was two, but we did sight bears a total of six times in our eight day stay. Five of our six bear sightings were willful. By willful I mean we went out driving to sight bear and found them - only one sighting happened by accident. 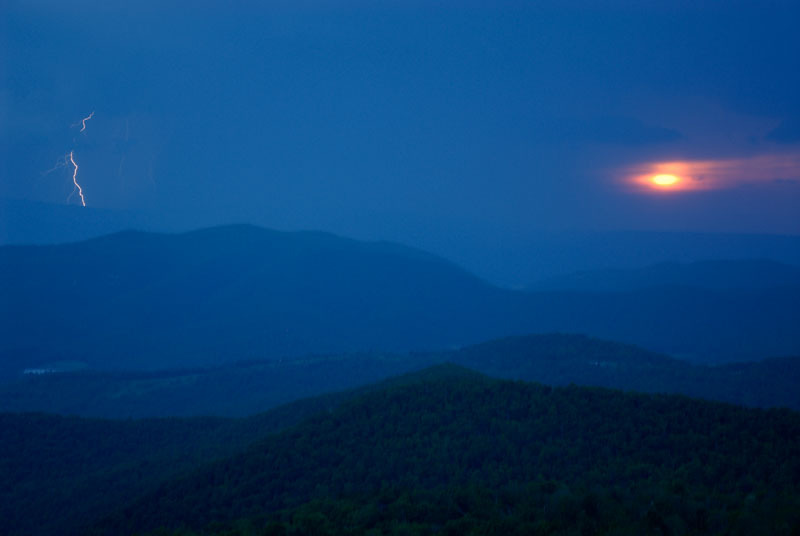 We found that you could pretty much predict that you would sight bear if you drove along Skyline Drive between one hour before and one hour after sunset. We generally went for a one hour drive during this time, just for this reason. I learned a bit about equipment readiness in the process of trying to photograph bears - a much greater challenge than photographing the deer of Shenandoah. Bears turned out to be much more wary when approached by vehicles and also tended to be visible only a little later in the day than the deer. My first photograph of a bear was botched because I fumbled with my equipment for too long and couldn’t get a shot off at all. Because of this I began leaving two cameras out each time we went out for our evening drives. One camera was equipped with a fast telephoto lens (anticipating low light conditions), my 70-200 f/2.8 VR Nikkor lens. The other camera was equipped for landscape shots with an 18-70 zoom lens. The camera with the telephoto lens was my Nikon D300 and the landscape camera the D200 (you can find a quick review and comparison of these two cameras elsewhere here on this site, but the main reason for choosing the D300 for the animal photography was the better low light capability of the D300.) Additionally, I dialed in an ISO of 2000 and an aperture of f/2.8 with an exposure compensation of +0.3 on the camera I intended to use on bears (my reasoning on the exposure compensation was that the bears were all black and could therefore easily lose detail if underexposed.) My choices of set-up were rewarded the first evening I did this. A sample shot of a solitary bear can be seen below. I wasn’t all too displeased with that one, but remained on the ready on our next outing. This time I almost didn’t bother getting the equipment ready. It was so dark and foggy that I didn’t think there’d be any way I would get a decent shot. 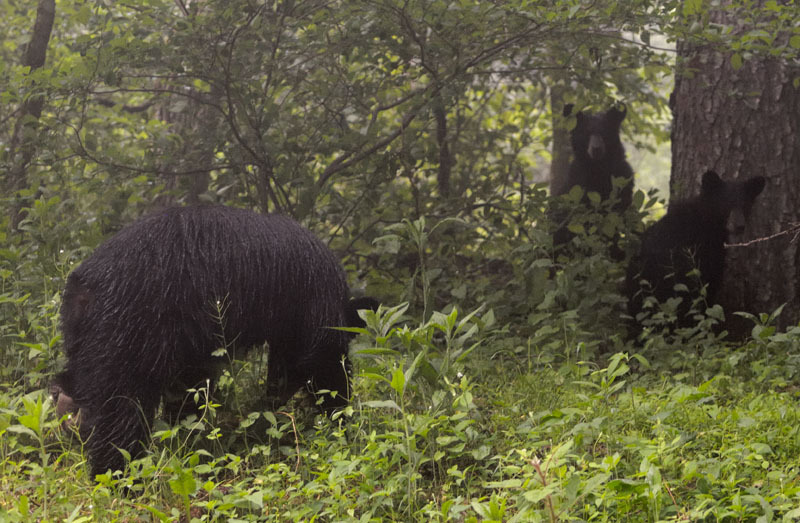 Yet, an opportunity presented itself where we saw a mother bear with two cubs. Notice how wet the fur on the mother is. It had been foggy and drizzling all day long. This image was taken in evening twilight under similar shooting conditions as the last one. Since I used f/2.8 and focused on the mother, the cubs are not quite in sharp focus. Also, they are deep in the shadows in the woods - the exposure conditions here was very difficult. I would like to point out that I do not recommend getting out of your car if you ever try to photograph bears like this. All of these images were taken from inside the vehicle. The prudence of this was evidences when I photographed the last bear (the image above). This animal crossed from the left side of the road to the right as I was photographing it. I tried to hide some behind the branches on the right side of the road, as can be seen in the image above, and then made motions of rushing our car as I was taking pictures. It tried this several times until I decided the better part of valor was to gun the vehicle to prevent it from damaging our car. The sound of the accelerating engine did send the animal scurrying off into the woods, but make no mistake: this animal was aggressive. The photograph above was taken from the drivers side of the car through the passenger’s side window. The bear was probably about 75 feet away. Well, now that I’ve shown images of “fake” Shenandoah squirrels, I would like to come full circle. We DID see some real squirrels on our days of hiking at Shenandoah. Over eight days and 31 miles of hiking and hundreds of miles of driving along the Skyline Drive we saw TWO squirrels. One of them was a gray squirrel, the other may have been a red squirrel which we saw on a hike. It was gone too fast to be sure what type it was. The REAL squirrels were more shy than the deer and the bears! A few years ago, my wife, her two youngest daughters and I drove part of the way across the country to Yellowstone National Park. This post is not so much a story about Yellowstone (a wonderful experience for all of us), but a story about “wildlife”. In Yellowstone we encountered many animals that we do not see on the East Coast - animals such as wolves, bison, moose and elk. We did not see any wolves or moose on that trip, although we did indeed see bison and elk in abundance on our trip. On a sightseeing bus trip that we took to orient ourselves at Yellowstone, one of the other sightseers told us that Elk were “like squirrels” in the park and in much of the west. In our neck of the woods white tailed deer probably outnumber squirrels. Still, they are not so tame. Getting really close to a deer is not always the easiest endeavor. Yet, seeing deer, even reasonably close to the car is not an uncommon sight. Photographing them might be JUST A LITTLE more difficult. This week my wife and I are camping at Shenandoah National Park and are finding that deer are even more common here than they are at home. I suppose that this ought not to be a big surprise as there is no hunting in this park. 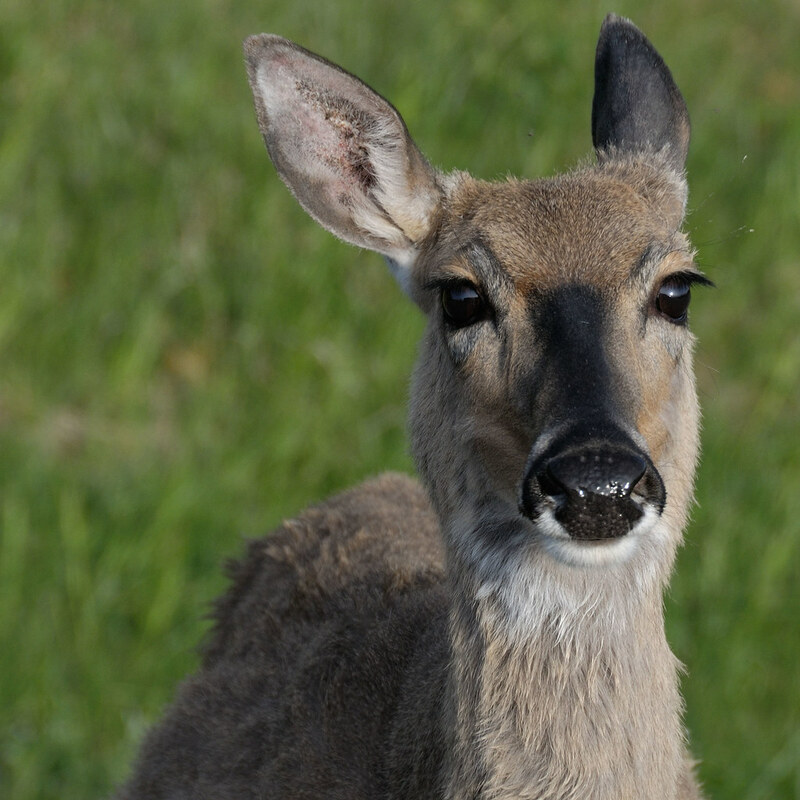 To avoid habituation to humans, it IS prohibited to feed wild animals at any National Park, including Shenandoah. Walking around the meadow with the deer grazing around me was pretty amazing. I was able to go about my business photographing them without them even seeming the slightest bit alarmed. My closest approach was probably about 50 yards, and the deer actually wandered by me even closer than that. Now here is where the squirrel part comes in. Have you ever hand fed squirrels at a park? Well, I have to say that even squirrel teeth that close to my fingers might be a bit uncomfortable to me. Clearly, an animal the size of a deer really ought not to be hand fed. 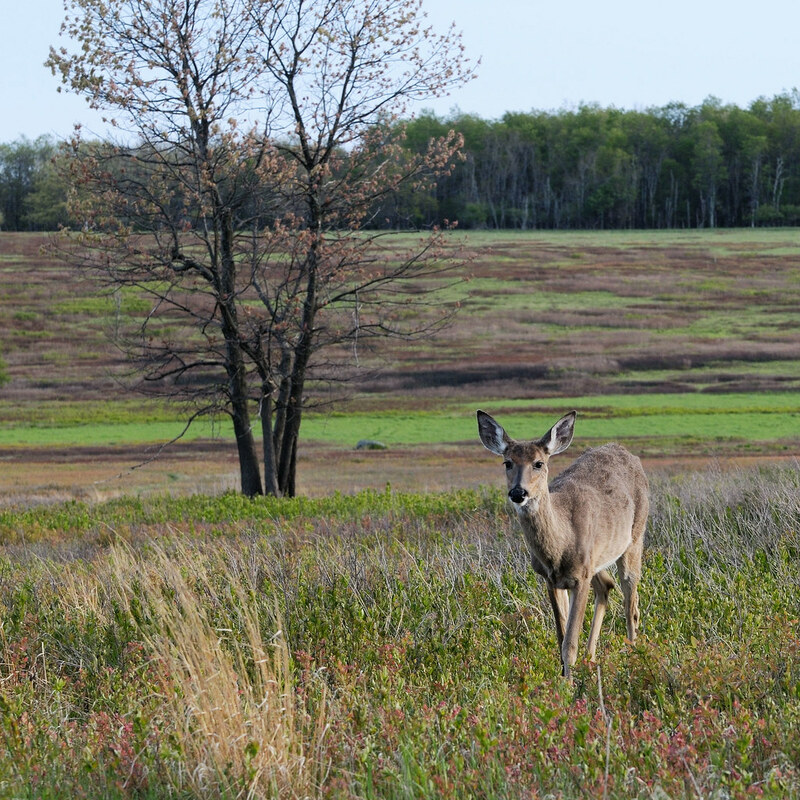 Yet, the deer in the image below was photographed no more than six feet from our vehicle. This animal actually CAME CLOSER to the car when I opened the window. (Any guess WHY they tell us NOT to feed wild animals?). As I photographed this animal it occurred to me that many an ignorant drive by animal feeder might feel these unwitting critters food that would disrupt the easily disturbed ruminant digestive tract. Clearly, these animals really are as common and as tame as squirrels might be in a city park. Also clearly, SOME people MUST be breaking the law and feeding these animals. For shame. Well, that’s it for my break from camping! Today was a rainy day and we drove off the ridge to do some shopping and paid a visit to Panara Bread for coffee and lunch. Off back to the not so wild wilderness! No, the plural really should be trilliums! However, I thought it might be useful to make a comparison between the varieties I have encountered. 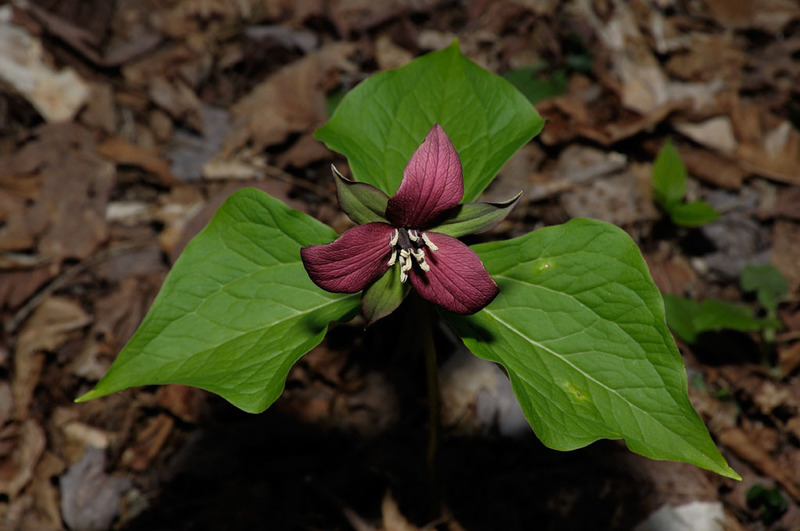 Probably the most common in the area that we live is the red trillium (trillium erectum) in my previous post. However, New York State also has large flowered (or white) trillium (trillium grandiflorum) and painted trillium (trillium undulatum). Here is a picture of some large flowered trilliums. This picture is not from New York, but from North Carolina. The species found in New York is the same the one in the image. The other type of trillium that I have seen growing wild in New York is the painted trillium (trillium undulatum). This image was taken in my back yard! 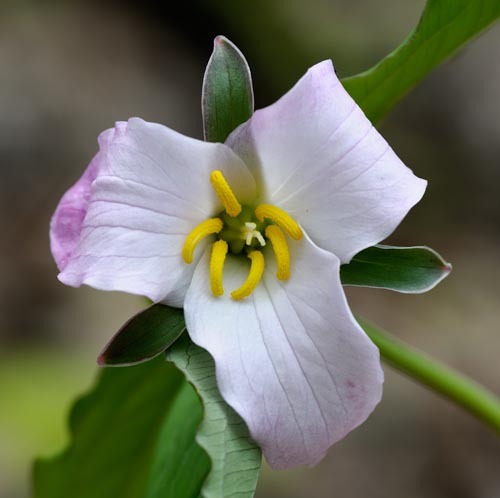 It is important to note that ALL varieties that I have shown images for here (large flowered or white trillium, red trillium, and painted trillium) are listed as exploitably vulnerable rare plants on the New York State endangered species list. These plants are not as rare as two other trillium types which I have not yet seen or photographed, the nodding wakerobin (trillium flexipes) and the toadshade (trillium sessile). Even so, it is always a thrill to see these beautiful flowers! Lastly, I’ll throw in a bonus image of a flower that is not native to New York, one that I actually posted in an earlier post from last Spring. 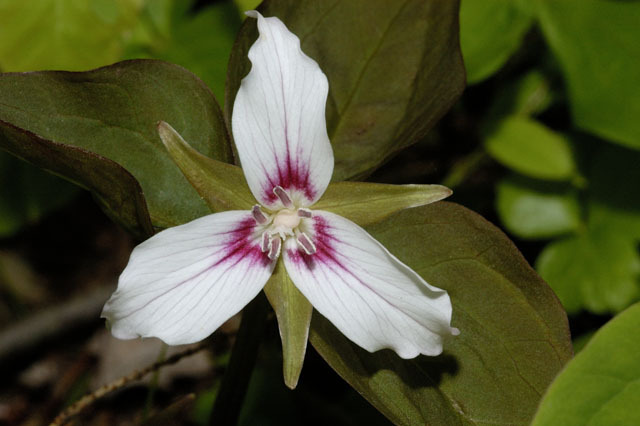 This one is found in the Carolinas and is called Catesby’s Trillium (trillium catesbaei). This one is pretty neat due to the different coloration of the flower petals as well as the bright yellow center. 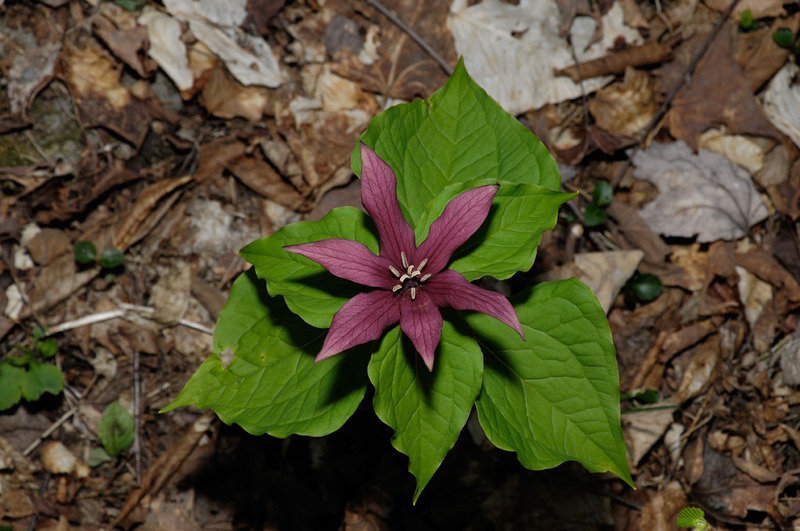 Although similar to the large flowered trillium (which also turns pinkish when it has been flowering for a while), this flower is much smaller, and the flower itself is bent down over the stem, more like the red trillium. Now, when hiking with the dogs, they have a tendency to get bored when confronted with long waiting for their master to take photographs of flowers. This is what my dog looks like while waiting for me to be done. This is Worf, my long nosed German Shepherd, long nose due to distortion of the 12 mm wide angle setting of my 12-24 mm lens from close up. Worfo at 12mm, close up. My last few posts have been about the colors and images of spring, as I encounter them in my rural area of the Southern Tier of New York. In my quest for images, I try to include my photography students at The Family Foundation School, a boarding school for teens at risk. My Monday class section visited a local waterfall which is very close to the school. I take my students to this location once or twice a semester, because it is only 3 miles from the school. Interestingly, I did not have my digital camera along that day. My students are working on a “Kodachrome” project, taking images on the last run of Kodachrome 64 slide film to be produced (ever) - but that is a blog entry for another day. Since my students were shooting film, I also had my film camera along. I did photography a red trillium with Kodachrome 64, but I cannot post that image here, as the film has not yet been developed. However, here is what it looks like. My students were off one their own taking pictures, and I also wandered around looking at the falls and the flowers on the forest floor. To my great surprise I saw the flower in the image below - about six feet away from the one in the picture above. Wow, I thought to myself - what is this? There was SO much similarity between this flower and the others that it almost HAD to be a genetic oddity. I went back and forth between the two, counted the flower parts, studied the leaves, sniffed both flowers (I did not detect any odors from either plant, by the way) and came to the same conclusion. This plant HAD to be a red trillium! Dennis also recommended I try to pollinate this plant and collect some (only some, to interfere only minimally with nature) of the fruit and see if the plant can be propagated. In addition, he recommended I go back next year to see if the plant comes back with the same anomalous features. Definitely a recommendation I will follow! I have also been showing all of this information to my students, and hope to share anything new with them as I find out more. This is what lifetime learning is all about - something we try to teach our students every day. AND, in case anyone was wondering, I just HAD to take my digital camera back to the location where the plant was to capture the images in this post! Amazing the conveniences we take for granted, these days. One of the wonderful things about spring in the Northeast are the beautiful pastel colors that emerge from the dead brown colors of late winter. 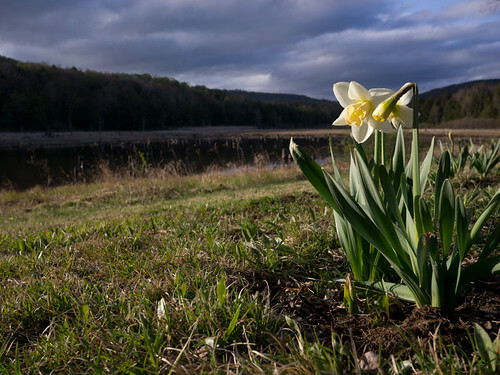 In our little area of the Catskill Foothills spring is now in full swing and the golden yellows, light greens, reds, pinks and whites of the budding trees have reached a glorious peak. Especially in early morning and evening low-angle light, the back lit colors of the trees are amazing. In addition to the new life in the branches, new growth in grasses, ferns and mosses can be seen on the forest floor among the detritus of dead leaves from the preceding fall. On a recent walk with my wife, about ten days ago, I had the opportunity to photograph some spring flowers popping through this blanket of brown on the floor of a hardwood forest. The brown leaf litter was dotted all over with these marvelous little white and pink flowers. 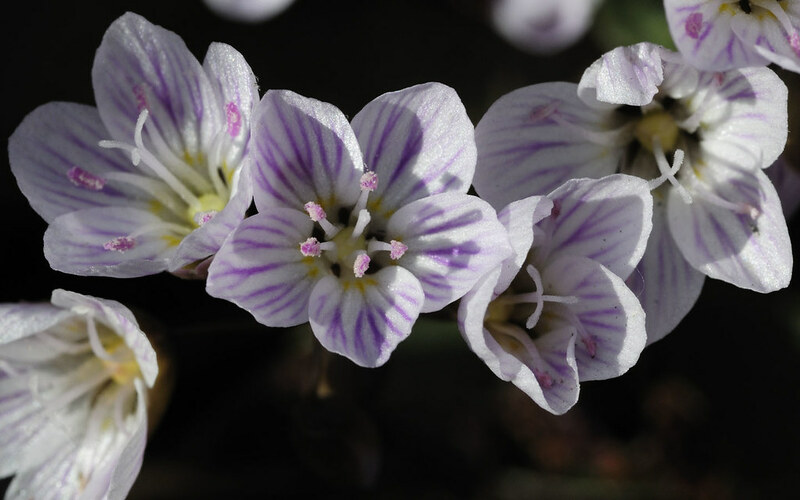 I have not positively identified these flowers, but I think they look most like spring beauties, based on a little research that I did. The image below was captured with a 105 mm AF-D Nikkor micro lens and the Nikon D300.